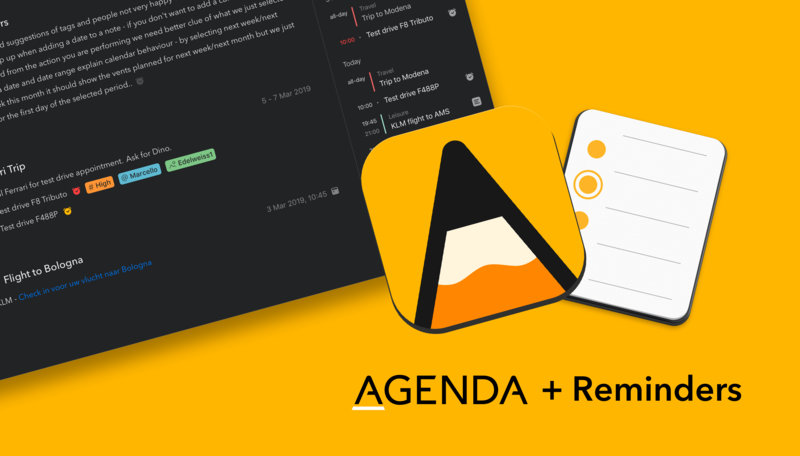 Agenda is a strong new entrant in the arena of note taking apps for Mac, iPad, and iPhone. It’s elegant and powerful — Agenda was the only Mac app to win an Apple Design Award in 2018 — and includes a few twists on what you have come to expect from a note taking app. To begin with, Agenda focuses on dates. You organize your notes chronologically in projects, with each project flowing from future, through present, and into the past. Use Agenda to plan for a future meeting or vacation, and have your notes ready when it is time to begin. When it’s all over, the very same notes are preserved for posterity in Agenda’s unique timeline. You can even link notes to events in your calendar app, and edit the events without leaving Agenda. Rather than competing with your calendar, Agenda complements it, working perfectly in tandem. Even more exciting, the Agenda team is putting the finishing touches on an update which will bring that same level of integration for Apple’s Reminders app. Reminders is great tool for scheduling tasks that are due at a particular time or place; in just a few weeks time, Agenda will allow you to create and edit reminders without leaving the app. Similar to calendar support, the Agenda team have opted to integrate with the existing Reminders app, rather than reinvent the wheel. You will be able to link reminders to list items in Agenda, so that you get a notification when they become due. Agenda will autofill as much information as possible, making it ridiculously easy to create new reminders for your tasks. There is even support for a markdown-like syntax, so you don’t even have to stop typing. Agenda is free to download and use forever. It is a great time to give it a try, because there is now support for importing from Evernote and Apple Notes, and free sync via iCloud. A premium feature upgrade is available via In-App Purchase. It includes all current premium features, as well as new ones added in the next 12 months. Best of all, the features you unlock are yours to use forever — strictly no subscription. Our thanks to Agenda for sponsoring MacStories this week.